The Video Game Authority has always been a controversial topic, and it’s polarized much of the gaming community. Many love it, many hate it. But most people who have the strongest feelings about the company often have adopted the biggest misconceptions. To me, it’s one of the most fascinating institutions in the gaming community. There are many great qualities and just as many terrible qualities of video game grading, which I’ll discuss on a later day in Retro Chronicle’s collecting tips series. But from my experience, with the right games, the right condition and the right collecting goals, video game grading can be a valuable tool for preservation. This is my second VGA submission (check out my first here). In my opinion, very few games are really worth submitting. In fact, most graded games on eBay are generally both over-priced were not worth grading in the first place. But I digress. I purchased this copy of Final Fantasy Origins earlier this year for $15. There are a lot of sealed copies of the Greatest Hits version of this game in circulation. So I was able to pick this one up for pretty cheap at a local electronics store that bases their prices on Price Charting, which does not take into account if the game is Greatest Hits edition or not. Final Fantasy was one of the most influential early console role-playing games, and it played a major role in legitimizing and popularizing the genre. This was around the time when the potential for in-depth gaming was beginning to take shape, alluding to the greatness to come from the series during its SNES and Playstation era. 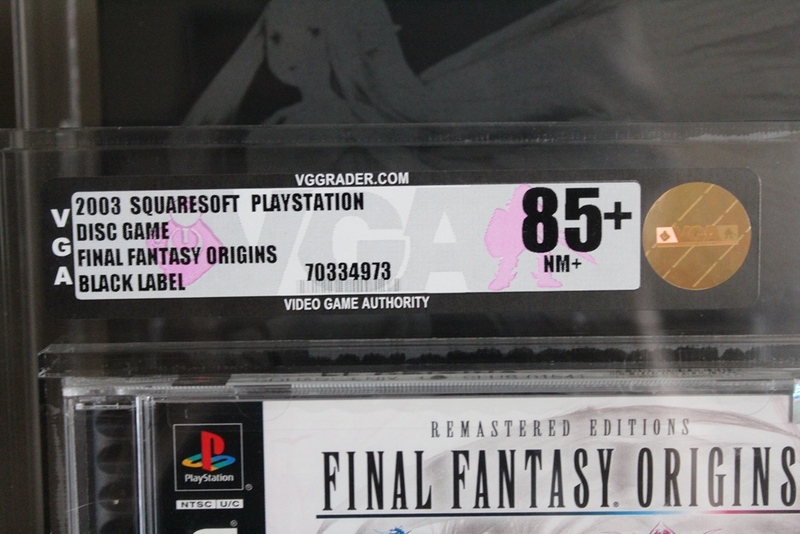 The grading fee for Final Fantasy Origins, since it is a standard Playstation game, was $25 plus shipping and insurance fees. It was graded 85+ which I’m really happy with. I never had a graded Playstation game, so I wanted to diversify my graded collection a little. I probably won’t be looking for used copy of this game any time soon, as early Final Fantasy games are generally remade/rereleased several times. In my opinion, the best remake of the original Final Fantasy was released in 2007 on PSP. That same version has since been released on iPhone, Windows and Android devices. I estimate this graded copy to be valued at around $90, although it will most likely remain in my collection. 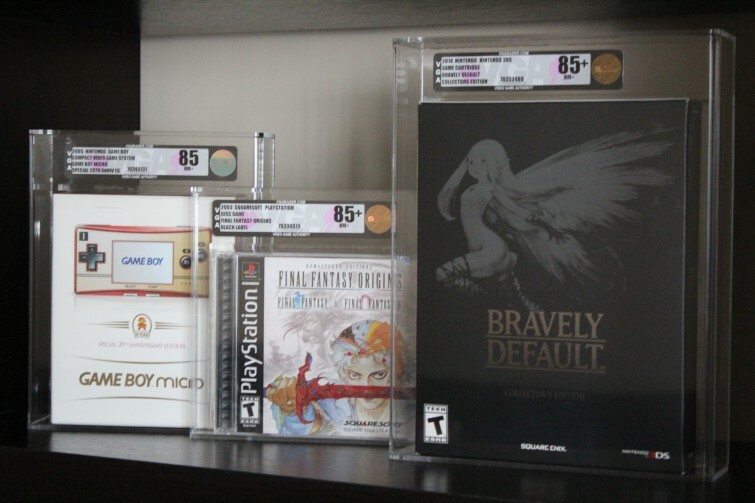 My fiancee surprised me with this Collector’s Edition copy of Bravely Default around the time it had come out. I had already purchased the standard version of the game. And after watching an unboxing video of this version and being a bit underwhelmed by its content, I decided to have it graded. Bravely Default has close ties with the Final Fantasy series. In addition to both being made by Square Enix, Bravely Default is a spiritual successor to the 2010 video game Final Fantasy: The 4 Heroes of Light, which also features a similar job and battle system. This edition included 34 AR cards, a CD of music from the game and the art book. The game was critically acclaimed at release and is frequently cited as one of the best games on the console. A sequel is already in the works called Bravely Second. Due to the unusual size, this item cost $40 to be graded plus shipping and insurance fees. It was graded an 85+ which is exactly what I expected. There were only a few barely noticeable blemishes on the box, but nothing that one would notice at a glance. 85+ is near mint, which I’m certainly happy with. I estimate this graded version of the game to be valued at around $140. Although, I certainly intend to keep this game in my collection. This is officially my favorite item in my collection. 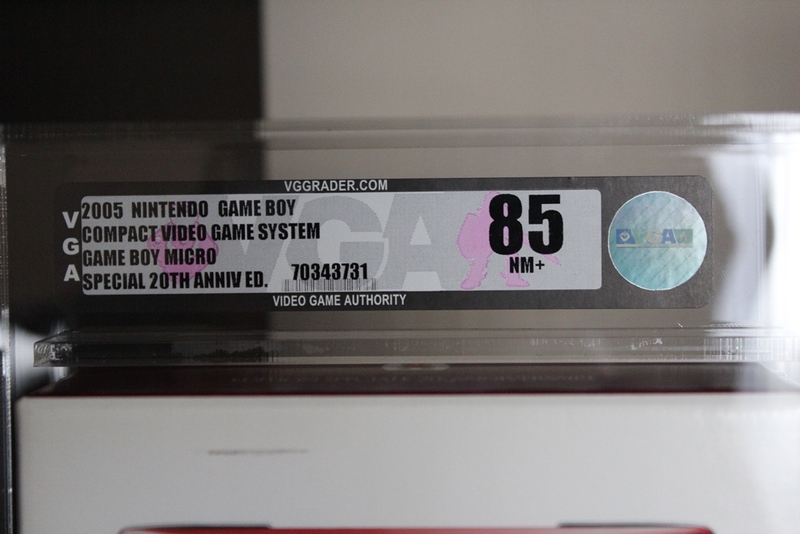 About a year ago, my collector friend decided to sell off a lot of his collection and was kind enough to give me an incredible deal on his sealed Game Boy Micro 20th Anniversary edition. He sold it to me for $100, and when I received the item in the mail, I was ecstatic with the condition. I have always loved the Game Boy Micro. Despite the impractically tiny screen, it was really convenient to play Game Boy Advance games on such a portable console. And when you hold it, it almost feels like you’re holding an NES controller with a really bright screen. Years ago, I added all three U.S. released variants to my collection– silver, black and Famicom editions. Perhaps what intrigued me the most about the Game Boy Micro was the way it was released and marketed. The Game Boy Micro was released almost a year after the Nintendo DS, which was technically its successor.To me, this seemed counter-productive for Nintendo to release a console that only plays GBA games after launching a new-gen console, which was also why many retailers weren’t interested in selling it. This lead to only about 2.5 million Game Boy Micro consoles being sold, compared to 43.5 million Game Boy SP consoles and 154 million Nintendo DS consoles. So it’s not a very common console, but it’s not rare either. I estimate this item to be worth about $625. I definitely intend to keep this in my collection. Not only is it the most valuable piece in my collection and the most unique, it also serves as a reminder of many of the great people I’ve met in the collecting community like the gentleman who gave me such a great deal on this Game Boy Micro. SUBMISSION NUMBER 3: COMING SOON? Not exactly. My last submission was only two years ago, and my next submission will probably be two years from now. 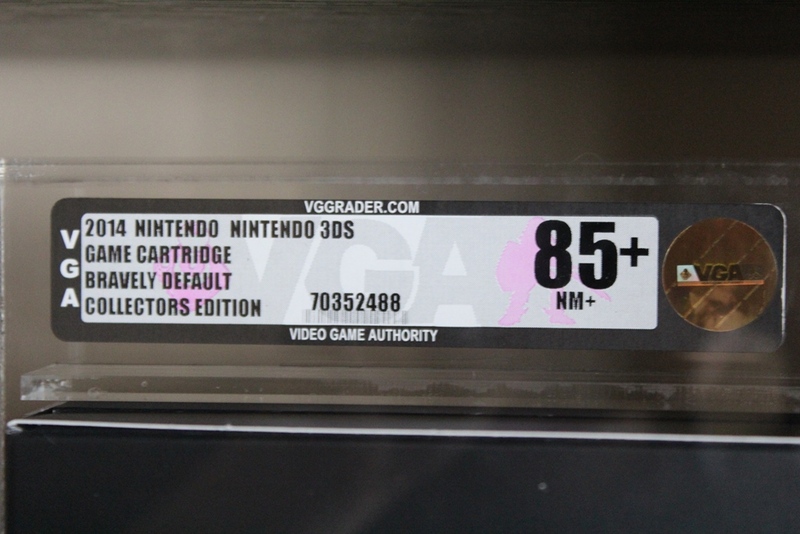 I have no intentions on expanding my VGA-graded collection very much unless I happen to stumble upon more neat pieces that are unique and in mint condition. Currently I have six VGA-graded games– these three and the three featured in my previous VGA-related posts. If I find more games worth submitting to be graded, I plan to set them aside until I have a medium-sized box full. And since I find the company so fascinating, I’ll continue to discuss the process more on Retro Chronicle. Very nice! they look so good dude! Origins is actually my favorite Final Fantasy I & II release! I even like Dawn of souls on the GBA more then the PSP releases. Primarily because they are both on the same unit, making it feel more like a mini collectors set.